By the time Terranigma was released, the hallowed SNES was nearing the end of it's life span, and in order to give the trilogy the send off it deserved, the proverbial boat was pushed out...far. 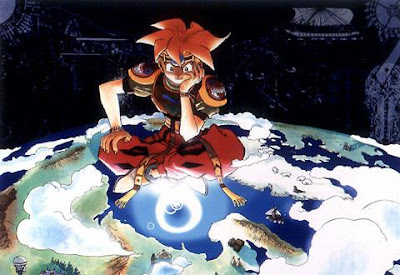 Boasting a 32mb cart (surpassed in size only by Namco's Tales of Phantasia), Terranigma pushed the system to it's limits, demonstrating just what that little grey box could do in the hands of genuine miracle workers. Showcasing some of the most impressive visuals and music the 16bit era had ever produced, Terranigma also managed to put many PSX, Saturn and indeed N64 games to shame. Wow. What can I say other than this is a beautifully written piece. Now I really want to experience the game in its fullest. I will keep my eye on eBay and see if I can secure a copy. Thanks man, I appreciate the kind words. I'm obviously biased but Terranigma really is one of those games that's worth it's inflated price. I hope you manage to grab a copy. Wow! I love this game, but I am impressed obout this post because I thought that this game was released in the US. I'm spanish and here it's known by everybody that many games are not released here but they do there. I have only scanned over this to avoid spoilers but I know your taste in games so will be no doubt entering into a bidding war with the people above for a CIB copy! Best of luck, man! It's a beauty so I hope you get it.